Access to the Ely Street entrance of Sodalis Nature Preserve is unavailable. Admiral Coontz Recreation Center is open to the public 7:30 a.m. to 5:30 p.m. Monday through Thursday and to 5 p.m. Friday. Senior Adult Dances will again be at the Admiral Coontz Recreation Center noon the 3 p.m. Wednesdays. 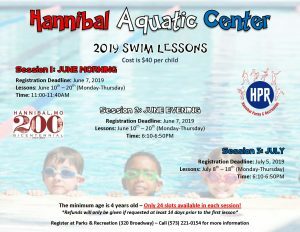 Join us for the 2019 Swim Lessons! Minimum age is 4 years old – Only 24 slots available in each lesson! The Hannibal Parks & Recreation Department has developed Scavenger Hunts to encourage visitors to the Hannibal parks. Hannibal children, along with visitors to Hannibal, will have a chance to explore our parks in a different way. These free activities allow participants to learn more about Hannibal Parks and to earn a free treat from a local business in the process! Here are the scavenger hunts available so far (check back for future additions). Sign up for our news alerts and keep up with everything going on at the Hannibal Parks & Recreation Department.